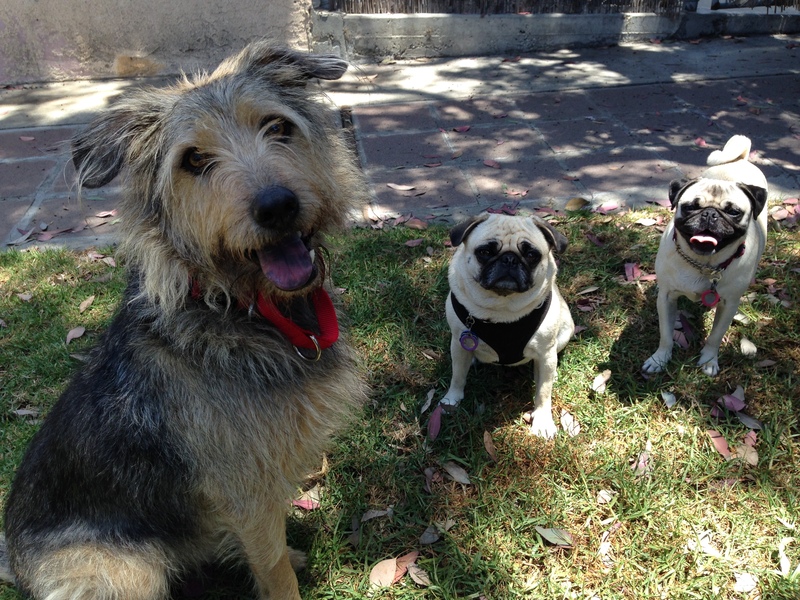 For this special 4th of July session of Dog Gone Problems, I traveled to El Segundo to work with Lucy (front) and Zoey. Their guardian called me in primarily to work with Lucy who is fearful and reactive to large dogs after a bad run in with one. When I met them in person, I noticed that the dogs showed zero respect of the personal space of their family members, jumping up on them and nudging them for attention. While this wasn’t the issue I was called in to help with, it is certainly linked to the issue. When a dog doesn’t have the proper respect for their humans, it often leads to a dog thinking it needs to control things on its own. To start changing the leader follower dynamic in the home, I showed their guardians how to define their personal space. By using movement and body language, their guardian was able to get the dogs to start respecting a small bubble of personal space around them. While running through this technique, I noticed that often one of the dogs would respond or follow a command right away and the other wouldn’t or would do so much later. This often happens in homes with multiple dogs where the humans pull out a treat for each dog despite how well a dog responds. I suggested that in the future they only pull out one treat and giving that treat to the first dog to comply. By only rewarding the first dog to obey, we can use jealousy to motivate the dogs to respond quicker as their is no reward for second place. 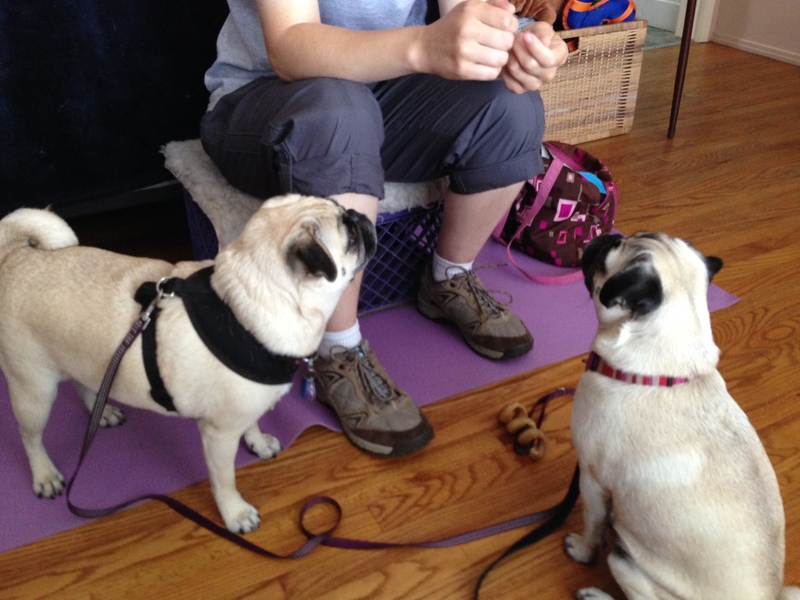 Once the dogs start obeying at the same time, then their guardians can go back to giving each dog a treat. To help the dogs learn to develop an ability to self restrain, I ran through a leadership exercise I developed. 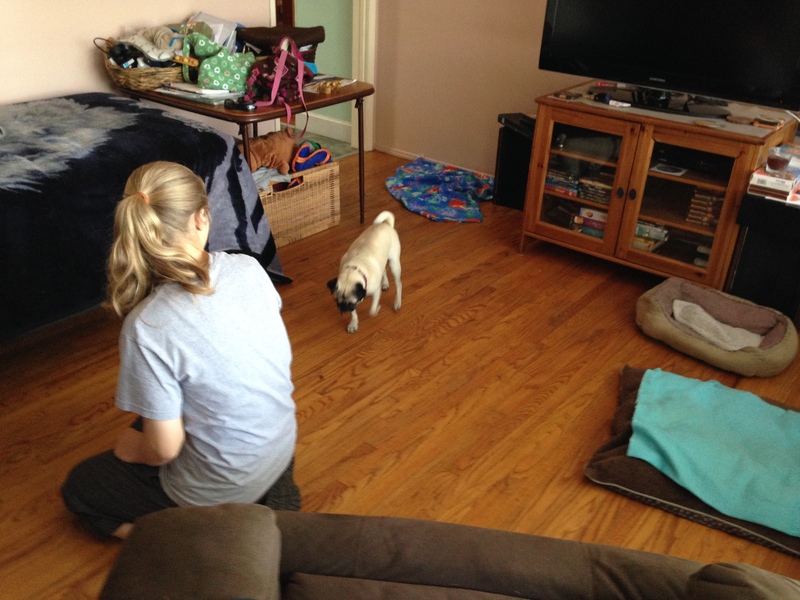 This exercise involves placing a high value item on the floor in the middle of the room then communicating to the dog that it is to leave it alone by claiming it as another dog would. The human establishes a boundary of three feet around the object then corrects the dog the instant it crosses this boundary. By correcting the dog the second it violates the boundary, we can communicate to the dog exactly where the border is. Only after the dog stays behind the boundary and lays down to communicate that they give up do I let them have the treat. I ran through the exercise a few times then coached their guardian through it until she got the same result. In addition to letting the dogs practice restraining themselves, this exercise also helps the dog see the human as the authority figure. This is a key component in this rehabilitation as the dog needs to feel that the humans have the situation under control in order to stop reacting when it sees or encounters another dog. We tested out how well the dogs understood and retained the lesson of respecting boundaries later in the session. I suggested that the family institute a new rule that the dogs could not come in through an open door way unless the human gives them permission first. 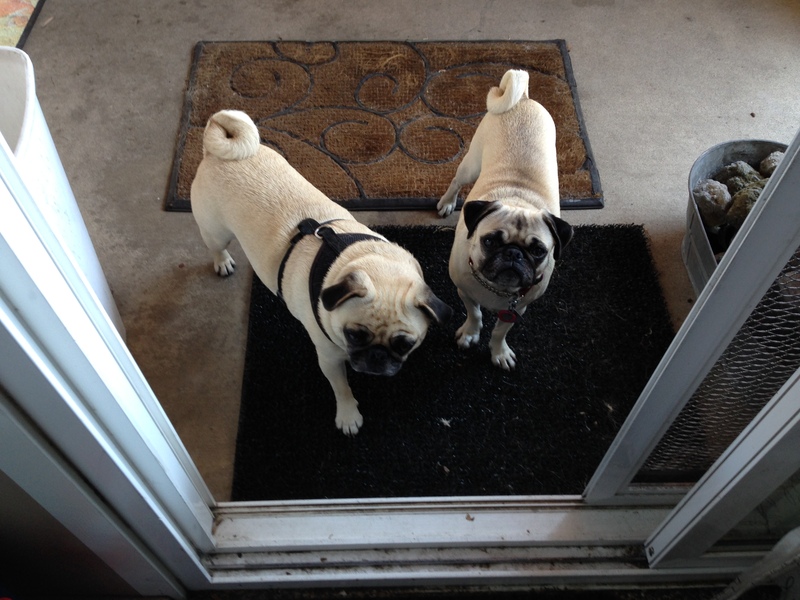 At first the dogs were a little confused, but they quickly understood and stayed outside the doorway on their own. To see what sort of state of mind the dogs went to on a walk, I had their guardian go through the process of leashing them up for a walk. As soon as the dogs realized that the human was getting a leash, they started to get over excited, barking, whimpering, running around and jumping up. I had their guardian replace the leashes and come back to the living room so we could discuss another way. Because excited dogs are most prone to getting into trouble, I suggested that they stop or pause the instant that either dog started to get over excited. She repeated the process, but this time put the leash back and returned to a seat int he living room each time the dogs started to get excited. It took about seven starts and stops, but eventually the dogs remained completely calm while their guardian got them all leashed up. I had brought along a dog named Moose to help me on the session, but I didn’t want to add him to the situation quite yet so I had one of the guardians take him down the street and around the corner before we brought out Lucy. I wanted to see her alone first before deciding on the next course of action. Lucy walked well on the leash and seemed in a good state of mind so I brought out Zoey and we headed off down the block. I had the person walking Moose move on ahead of us so I could judge Lucy’s reaction at seeing a dog before being able to smell it. While I could see her tense up a little, it was pretty minor so I closed the gap between Lucy and Moose. Within a few movements Moose and Lucy were walking together with a handler and I was walking Moose on their right. Lucy was checking out Moose while he was pretty much ignoring her, exactly what I wanted. 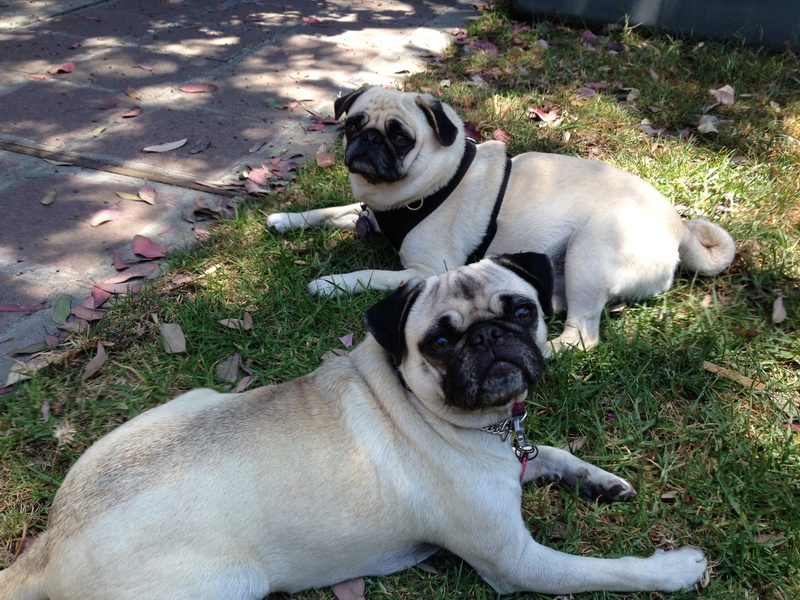 We continued walking the dogs this way while I observed them to be sure everything stayed calm and relaxed. After another block or two, Lucy stopped paying as much attention to Moose so I decided to add an additional challenge. I handed Moose’s leash to their guardian and she handed Zoey’s leash to another family member. Lucy got a little stiff again at first, but we continued moving forward and did not allow her to stop or control the situation in any way. 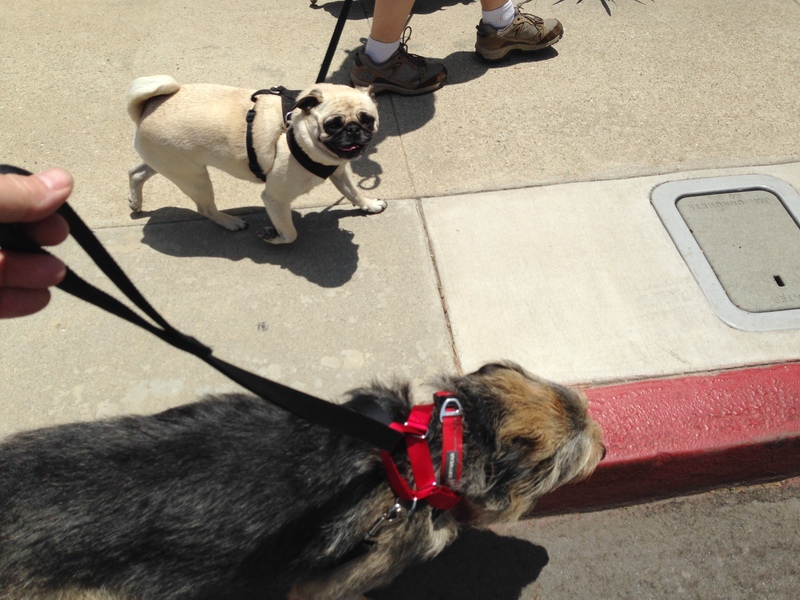 As we walked down the street Lucy was lagging behind and her movements were a little reserved. But as we continued on and Moose showed no interest in her, she started to grow more comfortable. A block later she started to get a little pep to her gait and started to walk next to her handler instead of behind her. Because things were going so well, I suggested we return to their home so we could let the dogs loose in the fenced in back yard. At first Lucy stayed away and Moose and Zoey played together. But as more time passed, Lucy started to relax again and even engaged with Moose a bit. Twice Moose sniffed Lucy’s rear, something that she reacted to strongly and something her guardian wanted to achieve in this session. When I was able to get Lucy to sit down next to Moose for a photo, I knew we had made great progress in the session. Lucy is going to need her guardians to continue to assume the leadership position and practice the new exercises and enforce the new rules and boundaries to continue to improve. As they do so, she will continue to see herself as being in a follower position in this family. This perception will allow her to stop being so reactive to the sight of other dogs and instead defer to her humans and let them handle security in those sorts of situations. It will take time, practice and good leadership, but based on how well she responded to the exercises and techniques we introduced in the session, her guardians know that it is in her. With their guidance, leadership and continued patience, Lucy will eventually learn that other dogs are not the enemy and in time, learn to enjoy their company.